This post comes to us via Graham Aubrey of Disc Jockey Geek. If you think you’ve got what it takes to publish a piece on The Music Entrepreneur HQ, you can find our guidelines here. Now, let’s get right to the good stuff. Being a DJ is arguably one of the most enjoyable professions in existence. Hell, your job is literally getting people up and onto the dancefloor and having a good time – how could you not love it? But something that many of us quickly realize when we take that first step into the industry is that it isn’t as easy as we imagined it to be. No matter the skillset, it isn’t that glamorous. There’s a striking lack of backstage parties, a notable absence of groupies, and most importantly, a significant lack of work available. The DJ world is highly competitive. Every man and his dog know a good DJ, and as a result, getting gigs can be challenging. This can make it incredibly difficult to make a living as a ‘professional’ DJ. But there are a few things we can do to keep the work floating in and build our reputation as a solid and high-quality DJ. Now I should also note that I am assuming that you have all the necessary equipment to make some money as a DJ, and your skillset is also up to scratch. 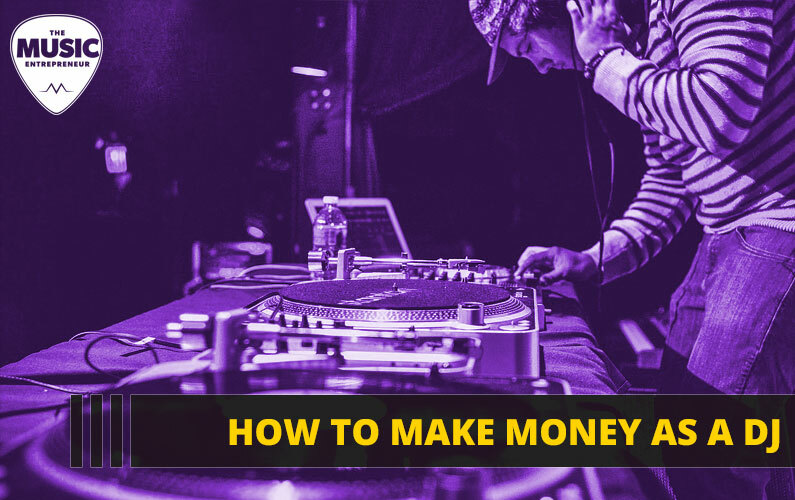 With this article I’m not going to be teaching you how to DJ, I’m going to be outlining some key aspects of making money as DJ – something that is often much harder than it is made out to be. As much as we would like to believe that we can let our music do the talking and the work will simply roll in, this obviously isn’t the case. A large part of getting work and developing a solid reputation comes down to building an online presence and promoting the absolute heck out of yourself. Create a Facebook page dedicated solely to you as a musician, and start posting frequent updates. A large part of this should be posting mixes on a regular basis, so people know what you sound like. You will also need a place to post your music and have it readily available for listeners. Taking this into consideration, your two best options are unquestionably SoundCloud and YouTube. These are ideal platforms for you to post your music, where it can then be linked through to your other social media accounts easily and efficiently. Create a presence and then create a following. Now this isn’t to say that you don’t already have enough friends – I’m sure you have plenty – I am specifically talking about meeting with people who already have both feet well and are truly planted within the industry. This means taking the time out of your schedule to network, and network hard. Familiarize yourself with local clubs, and get friendly with promoters, bartenders, and if possible, club owners. Put yourself at the forefront of their mind, and give them the opportunity to listen to some of your work (that online presence is starting to pay dividends…). The good news is that most clubs are always happy to get some new DJs through the door – assuming they are any good. So, if you’re good, and there’s an easy way to hear what you sound like, it shouldn’t be all that challenging to get that first gig. And a bit of a note on this: for that first gig, get as many of your friends to come along as you possibly can. If you can bring 20+ people on your first night, you’re starting to look like a pretty safe bet. During those early stages when all you want to do is play your personal mixes to a crowd, the thought of working as a wedding DJ may not be all that appealing. But that doesn’t mean it’s not lucrative. When you are first starting out and trying to build a presence within the local club scene, working as a wedding DJ is a great way to get a bit of extra cash into your bank account, while also providing you with an opportunity to hone your live skills. And if you want your personal brand to remain separate from the event DJ industry, you can sign with an event firm. This will allow you to work as a wedding DJ covertly, ensuring that you can keep paying the bills while continually building up your personal DJ entity. There are some genuine positives associated with living in the era of technological wonder that we do – one of which relates to our ability to make money without having to leave our own living room. Now, again, this is much more of a challenge than many think, but that doesn’t mean it’s impossible. As a DJ, you have a somewhat unique set of skills. You can capitalize on these skills in an online setting, allowing you to make some money and build your brand even further. And as a bonus, you can think outside the box on these. You could work as a freelance musician, creating tracks for websites and video advertisements. You could create and sell “how to DJ’” tutorials, providing video demonstrations of specific skills and techniques. This could also revolve around the specific software you recommend, and the equipment that you believe to be most beneficial. You could start a blog, a vlog, or a podcast. The online world is literally your oyster – so make the most of it! As much as it pains me to say, the DJ world is not as easy and as glamorous as it was once made out to be. To make it as a DJ in this modern age, you need to be highly skilled, extremely dedicated, and incredibly savvy. In saying that, making money as a DJ isn’t impossible. By using some of the tips outlined in this article, you can slowly build your brand and work yourself towards becoming a full-time DJ – all while paying the bills on time.